Giving back has always been part of Wayne Lineberry’s long-term plans. As a star linebacker for legendary coach Clarence Stasavich, Lineberry only knew of one way to be a Pirate. That way was full on, 100 percent. He did it as a player; he’s been doing it as a fan and Pirate Club supporter. But now, as when he was a player, he is bringing the sum of his skills – on point – to focus on helping his beloved Pirates in a way that will ensure that his alma mater has the tools to keep fighting… climbing… and working its way to the college football promised land. Lineberry’s plan has always been to find his way back to Greenville… back to where he has always felt at home. Only, he wanted to come back and make an impact on the program. His years as an executive in the insurance business – first with New York Life and currently with Virginia Asset Management – have taught him a great deal about financing futures. And if there is one future in particular he would like to insure and ensure, it would be that of the program. “I’ve been trying to get back to Greenville for a long time now,” Lineberry said from his home in Troutville, VA. “I have been in the insurance investment business since 1973… most was as a General Manager of New York Life… living all over the country. One of the things about getting back to Greenville, in 1983, I moved from Williamsburg, VA, to Tucson, AZ, with New York Life and I was the GM out there. The University of Arizona had what was called the President’s Club. It was an insurance endowment program which basically worked like, if you bought a $100,000 policy with a $10,000 cash value in 10 years, it would be like the equivalent of, say, a Purple Pirate (level in the Pirates Club). I actually hired some football players out there to work that market. And it is the same now with Virginia Asset Management and Pirates Club members who are getting involved. It should be no surprise that Lineberry is looking to contribute big-time to the program. It is the only way the former standout from Wadesboro knows how to play. He is a throwback player and he doesn’t hesitate to give a little nod the way of his former high school coach in appreciation for helping mold a Pirates star of the 1960s and, even more so, for contributing to the man he became after football... though, Lineberry admits, it was never a dull moment growing in Wadesboro and playing for the cantankerous former Pirates skipper. “Growing up in Wadesboro… hmmm,” Lineberry pondered. “I’ve always been involved in athletics but the big turning point for me was in 1963. You know, Wadesboro played in probably the toughest 3-A conference in the state with Rockingham, Hamlet, Sanford and those schools. We were just a little old tiny school (playing those teams). In 1963, we were Ed Emory’s first head coaching job and I can unequivocally say that the season of ‘63 and ‘64 – my junior and senior years – were unbelievable. I mean, the hardest I ever got hit in high school football was at half time…and I am dead serious about that. Though it may sound a little rough, for Lineberry and his ilk, that was the only type of football there was and Emory exemplified it in every inch of his being. As a player – one that would garner Prep All-America status under Emory – the fiery coach was just the igniter he needed. “Well… here’s one story on Ed,” Lineberry shared. “Here is an example… the thing I used to hate to hear him say was, 'Turn the lights on,' or, ‘One more play.’ We’d be scrimmaging but all we did was hit. We were mean as hell, too, but all we did was hit, hit, hit. Thursday night before a Friday game he’d cut the lights on and we’d stay out there for hours and hours scrimmaging. But we had a real good team… a hard-nosed team, and Battle Wall – both Battle and I were all-state from little old Wadesboro – Battle went on and signed with Carolina and did a tremendous job there. But we were playing one of those Rockingham teams and Battle got this guy in what we called a Twirly Bird… well, it was 1964, anyway… and you’d catch the running back and instead of throwing him down, you just start to twirl him around like a top waiting for the other guys to get to him. So, since he is coming around… you came in with helmets those days. You know, you can put out a lot people like that. There was never denying that Lineberry was an athlete. He was always pretty much bigger and stronger than than the rest of the pack, so football was a natural fit. In a town where kids dreamed of the day they would lace them up for Wadesboro High, Lineberry was one of those kids the coaches took notice of early. “I was pretty much always bigger than (my peers),” Lineberry said. “I was probably, like, I was listed at about 200 pounds. 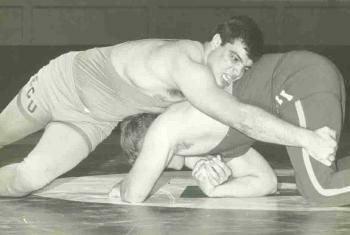 My junior and senior year, I wrestled and went to the state both years and I went at like 185 my junior year and heavyweight – 197 – my senior year. Still, for all his natural abilities – and there were plenty – Lineberry shudders to think what would have happened had Emory not found his way to Wadesboro. Under Emory’s mentorship, Lineberry parlayed his talents into post-season honors (1st-team all-state and 3rd-team prep All-America) and a host of scholarship offers, but there had a been a tug from East Carolina all along the way. “I thought I’d get a scholarship somewhere,” he said. “I had scholarships anywhere I wanted to go. Honestly, Battle and I were both highly recruited. When I played in the all-star game in the summer before I reported in 1965, they had me listed (as committed) at an ACC school. I was offered a full scholarship to Clemson by my third game my senior year. 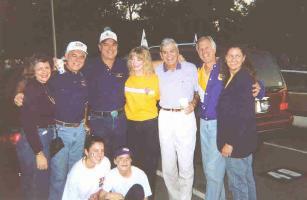 But Ed had brought the whole team to East Carolina for football camp and it was more exposure (to East Carolina). So, I loved East Carolina and I loved the school. In those days, it was like N.C. State, Carolina, and Clemson where you wanted to go… and East Carolina. And Lineberry, being the big-time athlete, saw East Carolina as another type of candy store. He came in ready to take the town by storm despite being a newbie. Lineberry, however, came in not only with the attitude of an upper classman, he brought game. “I don’t want to say I was cocky, but I guess I was,” he said. And Lineberry also recognized the talent around him. Bred to play linebacker, Lineberry found himself out of place in Stas’s defensive his junior year. Still, even in hindsight, Lineberry acknowledges that the change did not sit well with him. 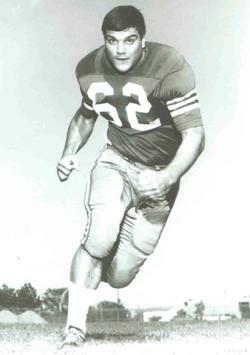 During his time at East Carolina, he experienced the highs of success and the disappointment of not meeting expectations, struggling through a 4-5-1 season as a sophomore in 1966, leading his team to a fantastic 8-2 campaign in ’67 and then leaving on a disappointing 4-6 senior season. “To encapsulate that whole era,…” he pondered. “In 1967, we had a tremendous football team. We had a really good offensive line with guys like Kevin Moran and Johnny Schwartz and Butch Colson – who finished fourth or fifth in the nation rushing – at fullback. But the next year, these guys leave, and our offensive line well… let’s just say Butch wasn’t as a productive in ’68. He got beat up pretty bad then. It tickles me because, I was talking about how the coaches today… like JT (former ECU coach John Thompson), and I saw where he was talking about Chris Moore, saying that 75 reps was too many and all that stuff. And I just laughed like hell. In ’66, we played the University of Southern Mississippi for the first time ever in Ficklen and we were in the game and it was like 12-7 into the fourth quarter. My senior year, they just annihilated us down there. Well, we went the whole Southern Miss game and did not pick up a single first down. How many reps did the defense play when we were on the field the whole game? The next game was the University of Richmond in Ficklen and we had gone into halftime and still had not picked up a first down. We went six straight quarters and the defense was playing the whole game… forget (the talk about too many) reps.
Lineberry recalls his time with great pride. Not just because of his contributions but maybe even more so because he knows he played during an era of football that has since disappeared. “The thing about that era…,” he thought aloud. “Just like the Junction Boys and Wadesboro High School, these were tough times, we didn’t get water breaks like they normally do. I remember we would scrimmage for hours without a water break. I remember there was this one guy who was a backup center – he really wasn’t a college ballplayer – but he just loved it and wanted to be on the team (at ECU). He had one of those old facemasks – a double bar that just kind of hung down. And we get out there and I started to say, George Wheeler was real bad about it… but rest his soul, he is not here to defend himself, but we get out there and somebody said, ‘OK let’s do it.” We’d break his nose so that he’d bleed on the ball and the coaches had to come out and change the ball and they’d give us a water break. And Lineberry has a good example of that from his days. Lineberry knows that what he is seeing today on the field doesn’t resemble his days in the Purple & Gold. Lineberry’s time at East Carolina was a tumultuous time for a teen-ager. It was the early stages of the Vietnam War and even on the tiny campus in Greenville – sandwiched between Camp LeJeune to the Southeast and Fort Bragg to the Southwest – tensions were in the air. For Lineberry – whose brother had just returned from his first combat tour at the time – there was quite a bit of emotion running just below the surface. And when that angst came out, it almost ended his career. 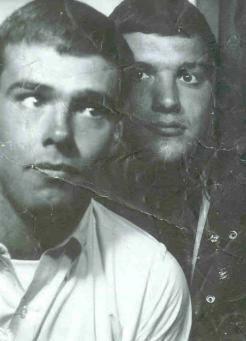 “I almost got kicked off the team in 1966 because I was over at the Student Union one day with Richard “Rooster” Narrow – who always reminds me of this story when we talk – but that was the first year that my brother, Jerry, was in Vietnam with the 5th Recon in the Marine Corps,” Lineberry said. “I’ve always been a little conservative... well, real conservative. So, I’m walking in the Student Union and the art department had a pro Viet-Cong table set up. Now, 1966 was a little early for that stuff to be happening, so we go in there and stand by the fountain to get a drink. I made a comment to a bunch of ballplayers and I said, ‘If somebody buys a drink, I’ll go and throw it on (the guy at the table).’ So they gave me a huge drink, the biggest you could buy, and I walked up there and said, ‘What are you guys doing here?’ and I just slung the drink over there. Well this guy jumped up and he looked like Grizzly Adams in coveralls. I mean, this guy was bigger than me. When he jumped up, I just grabbed the table and turned it up and slammed him. I didn’t want to let that big guy up so I was just pounding away. And we had a melee there and I don’t know where all the reporters and police came from, so I just slipped away. He chuckles about the story now, but Lineberry can’t really retell it without the laughter eventually turning to pain. In an ironic note, Jerry Lineberry was attached to the 7th Marines of the 1st Marine Division for his second tour and that very unit is the same that Wayne’s younger son, Jerry Matthew Lineberry, served with in the Marine Corps. Much like the fight in the Student Union, Lineberry always identified with the toughest of times. Where many a player might hope to draw the weakest link in an opponent to exploit, Lineberry was very much the type of guy who wanted the toughest match up, the biggest challenge. So it is no surprise that he recalls most vividly some of the toughest moments he encountered as a player. “In 1966, we played Louisville and Southern Miss and they were playing like an SEC schedule then,” he recalled. “We played West Texas State who had Mercury Morris and Duane Thomas – who played little because of Abbie Owens – and there were five or six of those guys who were with us with the Buffalo Bills. These were good football players. But, have you ever heard of Parsons (Iowa) College? Now get this and this is very important because people think you‘re crazy if you retell it, but Parsons College was written about in Sports Illustrated and was called “Flunk Out U” because anyone with money could go there. “Now Parsons dressed in Green and White just like the New York Jets,” he said. “I played against the New York Jets and Parsons College was bigger than the New York Jets. The fullback was Frank Antonini, who was an all-SEC player at Kentucky, and then there was a receiver who was all-SEC at Alabama who had to leave for some reason. They were a semi-pro team. We were the only team that ever beat Parsons at Parsons. We beat them 27-26 on a frozen field and it was absolutely miserable. But it was a Neal Hughes highlight film. He was going on both offense and defense. So Hughes made a long run and scored. He gets excited when he talks about his former teammate. Lineberry also likes to retell the story of the hardest hit he ever witnessed. “We went to Southern Illinois in 1966 in Carbondale (IL) and they were a huge team, too,” he said. “It was a punt, and Flowe peeled back around and was coming down the sidelines and this big old guard – I think Robert Ellis (WB, 1964-66) was running the ball to the sideline – and this big old guard was reaching out just fixin’ to tackle Billy. So this guy has run 20 or 30 yards and Flowe is running 20 or 30 yards – that’s a lot of mass coming together – and Flowe is coming right at him and this guy never sees Flowe. Just as he’s reaching out to tackle Ellis – right in front of our bench – Flowe went past him and the only thing that hit him was Jim’s forearm to his face, so the guy goes parallel and his helmet came off like someone threw it down the field about 15 yards. He gets excited thinking back on his years and how he played as a Pirate. Coming off a tough 4-6 senior season, Lineberry wasn’t sure of his future. He felt deep inside that being played out of position on the defensive front most likely erased any opportunities he might have on the next level. It was wartime and having a brother who had spent a tour in Vietnam and living in a pro-war atmosphere, Lineberry mulled following in his brother's footsteps as a post-graduation next step. The call came from the Buffalo Bills in the 17th round. Which was true, at least, in Lineberry’s case. The throwback linebacker consulted his throwback coach and got some advice that might have been pure, but not so wise. Lineberry was quickly introduced to the NFL in camp. Indoctrinated to the talent level, Lineberry settled in to make a run of it. And he did well and had a lot of fun doing it. After two seasons in the ACFL, Lineberry felt like he saw the handwriting on the wall for his professional career, so he made a change. “I went back to graduate school at East Carolina,” he said. “I didn’t know if I could go back to the Bills that year, though I knew I could certainly go to Hartford to play. But, I already had my teaching degree, so in 1971, I just went for my Masters. 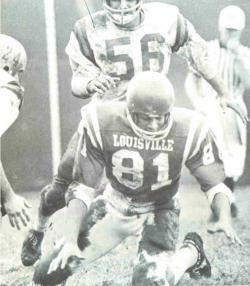 In ’71, Lineberry was a graduate assistant under Sonny Randle. Among the players Lineberry found and recruited was a 5-11 defensive end from Havelock named Cary Godette, who turned out to be an All-America at East Carolina. Lineberry had insisted that, though Godette was not the 6-3, 6-4 type most Division I colleges were looking for, the defensive end would be a great one at East Carolina. Godette, of course, proved him correct and he never forgot it. It was these types of relationships that had so bonded Lineberry to East Carolina, that it sometimes made making the right career decision the hardest thing to do for a tried and true Pirate. His coaching career at Wadesboro – and in general for that matter – would be short-lived as another influential Pirate came calling. So was the beginning of a stellar career in the insurance business. It is fitting that it was one of his coaches who mentored his non-football career. Where Bullard was a corporate sponsor for Lineberry, it was Emory who was the biggest influence. Lineberry has always followed the program since he left Greenville following his playing days. He has been a loyal Pirate Club member and he has been a fan, making his way to as many games as he could each year. Everything was pulling him back to his beginnings. And the pull has never been stronger than it has been of late, watching his beloved program fall on hard times. He has oftentimes thought how gratifying it would be to have a few minutes with some of the players on the team to share a little of his own history. “I think it comes back to – and I was talking to Harold Robinson, and he was like, I could come talk to the team about what it means to be a Pirate and about the chip on the shoulder – and I thought about, ‘Why did I wind up a Pirate?’ When you have to fight for everything you have, you get the Pirates’ attitude. You get the attitude of Leo Jenkins – God Bless him – you get to be associated with him. He has had such a great impact on many of us and we watched how he fought the big boys in Chapel Hill and Raleigh. And what else would he tell the current players? “I would tell the players about what it means to be a Pirate and what it means to be standing out there on your home field. What those boys learn on the football field will last them for their lifetime. I am still close friends with many of my teammates… they are among my best friends. Lineberry’s ETA for Greenville is nearing, he hopes, and perhaps he will get his chance to share his stories with the current players. He wants to make money for the future of the program… and he really doesn’t have too many other hobbies these days. “I enjoy ECU football the most,” he said. “Of course, I still work out and keep in shape. I proved that I don’t play golf at the Lettermen’s golf tournament, because I borrowed Matt Maloney’s clubs and after 18 holes, I said, ‘Matt this is terrible you don’t have any good shots left in these clubs.’ When I was out West, I learned to snow ski out there – you know with the Rocky Mountains and Telluride right there. Getting back home to Greenville for good might be just what the doctored ordered for his psyche, but it could come at a hefty price to his ticker if things don’t change soon with his beloved Pirates. Lineberry is a fighter, in more ways than meets the eye. He likes to tell another story about that fighting spirit. “I see Jim Gudger a lot when I’m down in Greenville,” he said. “And this story is really his story, but I like to tell it. We played at the University of Tennessee in 1996 and I hadn’t seen Gudger in a long while and Jim said he was walking by a crowd (tailgating) and saw a big commotion and he saw me right in the middle of it. Now this was the first time he’s seen me in years. I’m standing in a group of about 50 or 60 (Tennessee fans) and they were mouthing off at East Carolina people and being rude – kind of like those fans up at West Virginia this year (2004). I was like, ‘Come on all you SOBs, c’mon, let’s go!’ I was challenging the whole group. He is definitely a fighter and his spirit has never been tested as much as it was recently when he faced much more than a crowd of angry Vols fans. Lineberry didn’t want to go into much more detail… no need. He took it head on and he is, so far, winning that grapple against the Reaper. If the brush with mortality did anything in Lineberry, it was to accelerate his plans for the future. And he is glad that that future is going to start sooner rather than later. “I’ve been a Pirate Club member for 28 or 29 years,” he said. “I’ve been a community chairman and everything else. I’ve been coming back with the same friends and have been since we got out of school. It amazes me that more – especially athletes – don’t give back. I’ve been since I was up in Richmond when I first went into management with New York Life. Stuart Siegel and I started the Pirates Club back up, up there (in Richmond). Just getting people to come out and have some beer and get Ed Emory or Pat Dye to come up there, you know. So I’ve been involved ever since I left school. Lineberry is excited now that his endowment strategy is rolling out with the Pirates Club. With his former teammate and head of the Pirates Club, Dennis Young, working with him, he feels like his mark will be deeper than the blood, sweat, and tears he left on the Ficklen turf as a player. His legacy, he hopes, will be putting in place the foundation for an endowment that is beyond the wildest dreams of those who count themselves among the Pirate faithful. As only a good friend can, Wayne Lineberry felt that a clarification was needed. See, in an earlier published Pirate Time Machine, former Pirates standout Jim Gudger (Blocking Back, 1967-70) retold a story about how as a freshman on Dr. Henry VanSant’s famed 1966 frosh team, he and his mates went up and laid the wood to the varsity squad in practice. Well, one good story deserves another. Lineberry stands by his take that, while the ’66 freshmen were highly talented, the account of the success against the varsity that year was “highly exaggerated.” But rather than retell the stories about playing the freshmen, Lineberry felt it would be better to simply zero in on the teller of the story. “I’ve got a funny story that is dead on accurate,” he said. 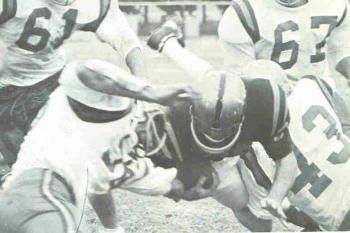 The first involved George Wheeler (Tackle, 1967-69). Just a short story as a warm up for his main feature… The Gudger Rebuttal. “So, Gudger comes up and Coach VanSant is psyching him up big time,” Lineberry said. “Well we’re doing 2-on-1 blocking drills and it is myself and Harold Glaettli (Center, 1964-67). So, Harold and I are there and we didn’t even have our chinstraps buckled. You know, it’s one of those deals where you hit and drive. It’s not slow motion or anything but it’s not 100 percent as you can imagine. So, Gudger is the one we’re going to block. We didn’t know that Coach VanSant was telling these guys to go after us and you probably should practice like that but we didn’t always do that on the varsity. Lineberry chuckles as he works toward the punchline. “So old Harold – and Harold used to play with a big ole wad of chewin’ tobacco – so Harold just spit and started buckling up his chin strap and I buckled up mine and he said, ‘Coach, can we do that again.’ You know, I knew what was going to happen. So, me and Harold lined up and Gudger got down there – an he thought he had really done (busted through us) before. Wayne Lineberry has been a Pirate all his life, really. He played for Ed Emory at Wadesboro and later went on to be a big-time star at East Carolina. He was a graduate assistant coach one season for the Pirates and has been a Pirates Club member for 29 years. As a former player who is still connected, Lineberry brings some great perspective to the problems facing the Pirates today. Lineberry took the time to share some of his thoughts on a number of issues. Note: This interview was conducted before the announcement that head coach John Thompson would resign at the end of the season. “I can tell you why we are here and this is nothing against Steve Logan… I liked Steve. But, while Steve did a good job and everything else, he didn’t quite have the personality of a head coach. The last couple of years with all the fighting and everything else and we had some good players, so don’t misunderstand what I’m saying here, but John Thompson inherited a tough problem because the bottom line is that our cupboards were bare. I read Boneyard Banter and PirateFans.net and I read all the people saying we got to get a new coach. No… no… you gotta give a coach four recruiting classes and judge him the fifth year. It’s pretty obvious… we’re playing seven JUCOs and a lot of freshmen. The problem, I think, he is doing a wonderful job. Do I agree with everything? No. Every decision? No. It killed me that we finally get Chapel Hill to come in here last year and with Stockstill, or Stuckstill I should say, we’re running a damn junior high offense. You know, up the middle, up the middle, pass, punt. It drove me nuts and I’m not saying J.T. is perfect, but the program today, to back J.T., I think he is doing a good job and he is bringing in a lot better recruits. I don’t care if they are from the moon if they put on the purple and gold and hit somebody. I feel good about the program. “I do all I can to support the program and have for 29 years. Well, it is the chicken and the egg theory. When you win, more people jump on the wagon. We’ve got guys that are former football players and I know how they feel – like they should be treated like a king because they played 50 years ago, so you have to bow down – NO! I’ve told players that guys (non-players) have been going to games for 30 years and they have given more than you have. I tell them, ‘You played four years, big deal, you got your education.’ I don’t understand why every former football player isn’t a Pirates Club member and season tickets holder… I really just don’t understand it. “I am going to tell you the way I saw everything go down. It comes back to being a Pirate. You come right down I-95 and go east. We’ve always had to fight. A lot of people in Chapel Hill would just as soon cut the state off at the highway and let the eastern part of the state float off out to sea. I grew up in the Piedmont… Wadesboro is near Charlotte. I didn’t know what it meant to be in eastern NC. It’s the same way as the North and South before the war of Southern Independence. You know, the industrialists and the monarchists and the federalists would gladly take all of the taxes and tariffs out of the south without giving anything back. Well, the people over in Raleigh and Chapel Hill would take all of the money out of eastern N.C. and not give anything back… it’s just like it. “And they ask, ‘Didn’t your governor help you?’ I’m like, ‘No, he said he is working on the budget and wrecking NASCAR cars. You don’t understand what it means to be a Pirate… we have to fight for everything we get.’ Comes back to that chip on the shoulder. “First of all, we’ve got to win in C-USA. I’ve got my coaching hat on now… but we have to win this league and everything else will take care of itself.